Okay, so this is the blanket I have been wanting to share with you! This is my Blessed C2C Blanket. 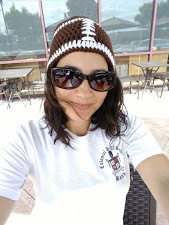 I normally schedule my crochet posts for Saturday mornings, but I am done with this post a little early, and I really, really wanted to share it, so I am putting it out early for you! I designed a fall themed C2C scarf that you will see later this year, but while designing, I envisioned this blanket. I couldn’t finish up the scarf fast enough to get this on my hook. 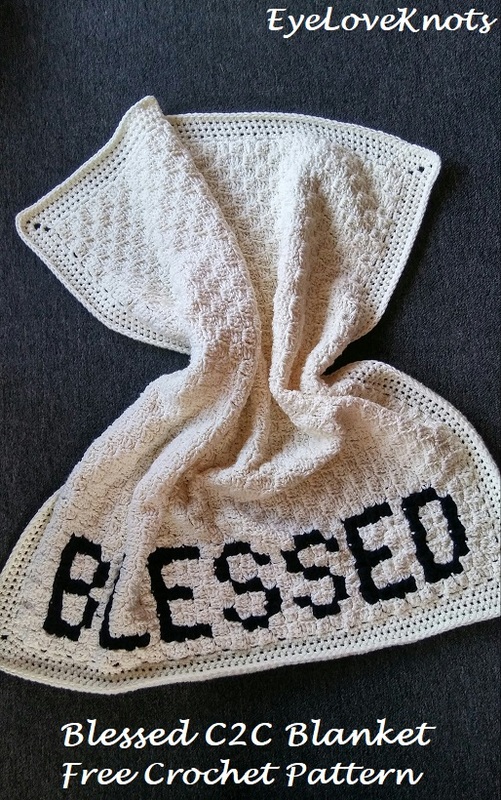 I have seen lots of items made with “Blessed” on. Have you spotted them too? Like the number of floral blouses, as well as throw pillows. Now you can add this one to the collection. I did consider adding tassels to my corners, but opted not to when I thought about how pom poms fall apart in the wash. I haven’t attempted to wash tassels, but I didn’t want to take a chance, and did want this blanket to be machine washable. Before we get into the pattern, I have a warning – I had 309 ends to weave in! I was bad, and saved all of the ends from the word until I finished the last letter, and ugh! I spent quite a bit of time weaving them all in. I also worked in a double strand of worsted weight yarn, and weaved each strand in individually. Read on for more information, and alternatives. 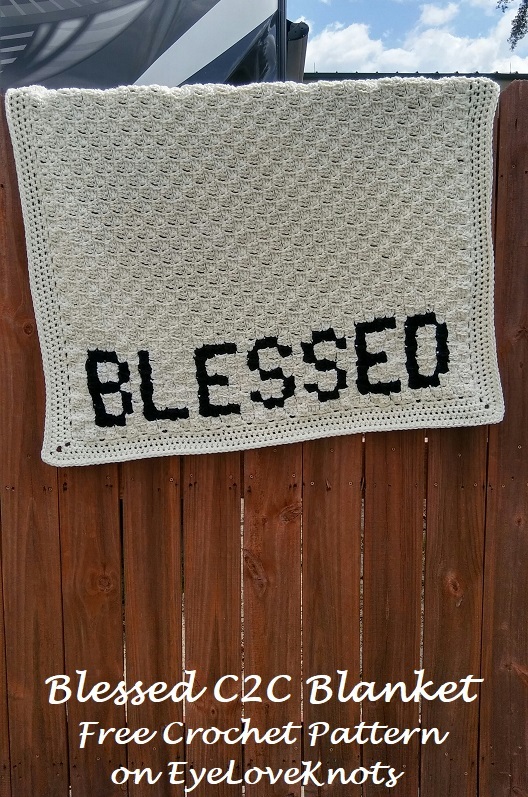 or EyeLoveKnots Craftsy – Blessed C2C Blanket. Yarn Alternative/s (if using the worsted weight): Red Heart’s With Love. This blanket took me just over 21 and a half hours. There are lots of factors that could affect this, the main one how you choose to weave in your ends. R2-R6: Chain 2, turn. DC in the 2nd DC and each DC across. This blanket grows from the bottom left corner up to the top right corner. I suppose this is the untraditional way of working a C2C, but this is how I worked this one, and the writing matches. You may follow the chart, and work in any direction desired. This pattern is written with colors and boxes only. 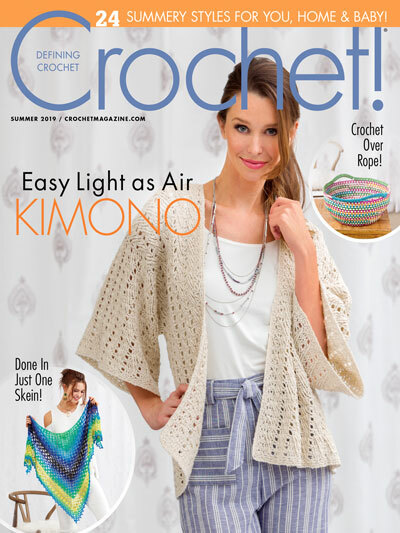 If you would like more details on how to work the corner to corner technique, and how this blanket works up (without words), visit my Basic Chunky C2C Blanket Free Crochet Pattern. Keep in mind, there will be connect points on some letters that will not be completely solid, and this is because of the direction worked. You will need to use some of your ends to cover up this gap before you weave them in. 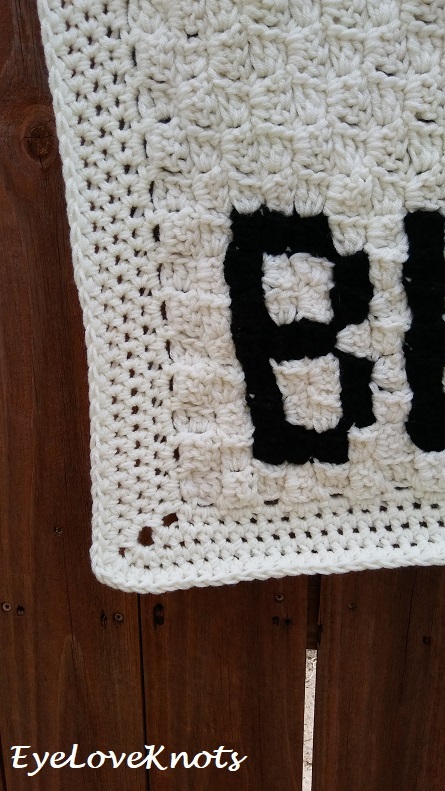 I have a photo tutorial for this – How to Cover the Gaps in C2C Letters. Bobbins: You will need a few ongoing bobbins while working the word portion of this blanket, which is through Row 42. You will be able to carry and work over your yarn, but in some spots, like where it goes back and forth with Ivory and Black, you will need a respective number of bobbins – sometimes six or seven. Working with bobbins requires lots of patience and maneuvering so they don’t get tangled. If you need help carrying and working over your yarn, or how to determine the number of bobbins you need (or what a bobbin even is), I don’t have a tutorial for this at this time, but Mikey of The Crochet Crowd has an excellent YouTube video going over all of this – How to Crochet Corner to Corner (C2C) Graphghans for Beginners. Work color changes in the final yarn over of the last stitch. I have a photo tutorial for this technique – How to Change Yarn Colors in Crochet the EyeLoveKnots Way. Drop old color to the back for now. 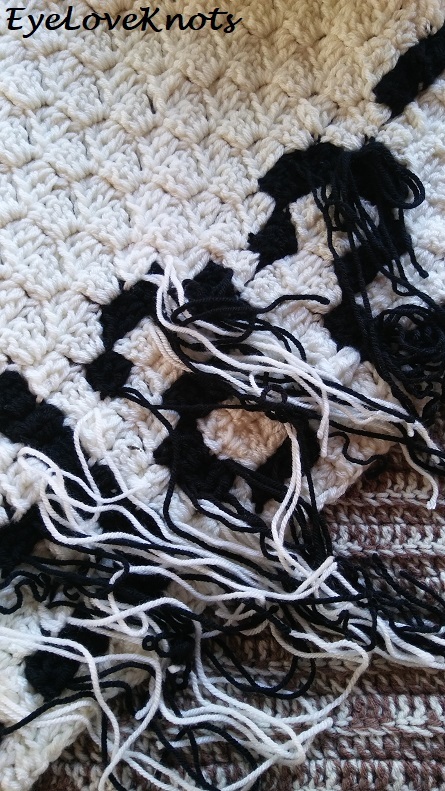 I highly recommend weaving in your ends as you go, or at least after completing row 42 where the final black is fastened off. While there technically isn’t a right or wrong side with corner to corner as it is worked turned the whole time, I still view it as odd rows being the right side, and even rows being the wrong side, this is especially true with words or images. 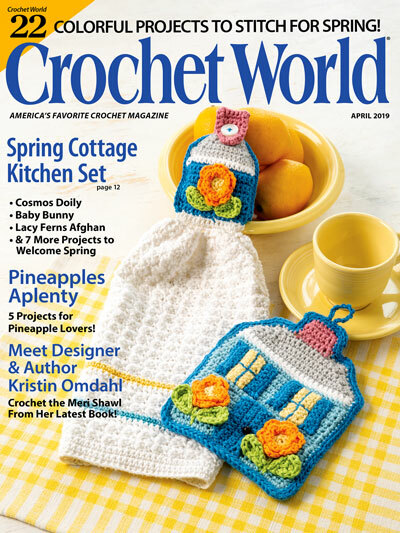 I suggest using a smaller crochet hook to bring all of your ends to the wrong side, and weave in on this side only. Also by weaving in one end (of the two from doubling your strands) at a time, and the second in a different spot, you eliminate extra bulk. 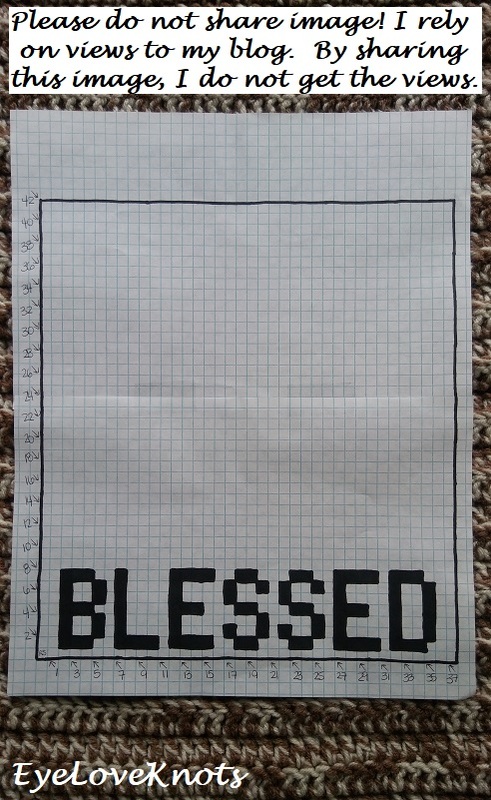 Add Width: Altering the width of this blanket is more difficult than the length only because the “Blessed” part is centered in between two boxes on each end, and the pattern is written to reflect this. You would have to add another box on each end, which isn’t as easy as if this blanket were written in standard horizontal rows. You would need to work four rows in the beginning of the solid color, then slightly alter the pattern for the words so everything else still lines up, and then work Row 39 as an increase row, and alter the remaining bit to finished up the “B”. It’s a bit more complicated, but can be done. I’d suggest working up a new chart, as it’s much easier to follow. *You will no longer work increases (chain 6…) in the beginning of the odd rows. You will turn, slip stitch into the 2nd double crochet, and next 2, and then begin the boxes with a chain 2. By working in this manner, the blanket will stop getting wider, but will keep growing in length. Row 42: 34 Ivory, 2 Black, 2 Ivory. (38 Boxes) Fasten Off Black. *You will now cut each row by one box to decrease all the way down. This is done by slip stitching into the 2nd stitch at the beginning of all of the remaining rows – no more chain 6’s. By working in this manner, the blanket will stop getting taller, but will work all the way down to 1 box to match the beginning. Fasten Off, and Weave in Remaining End/s. 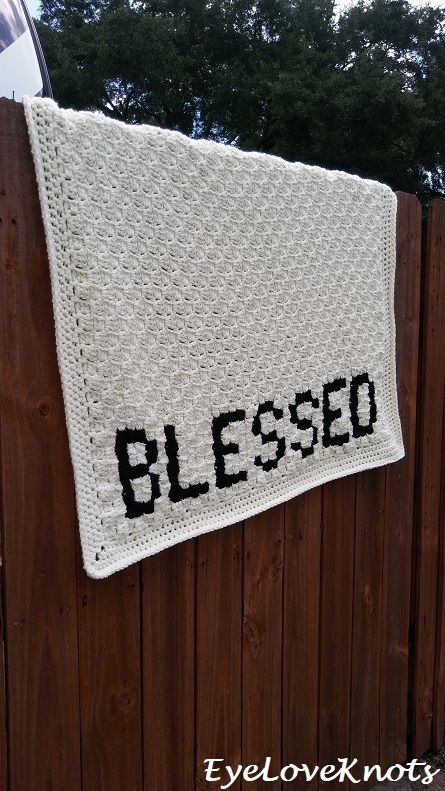 Please feel free to make and sell your own Blessed C2C Blanket using this pattern, but please DO NOT claim this pattern as your own nor should you sell my pattern, and DO NOT re-publish my photos as your own. DO NOT copy and paste my pattern anywhere, link to it instead. 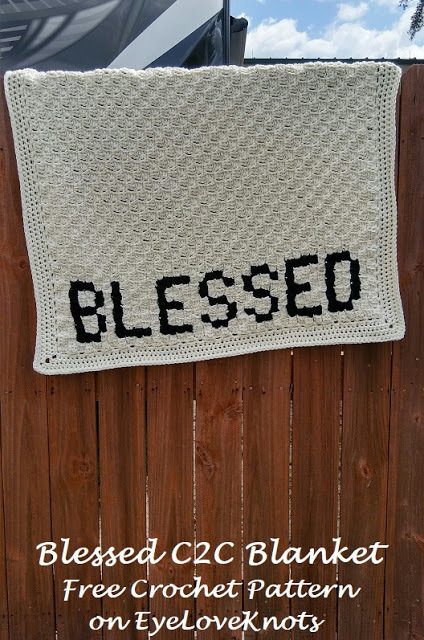 Share your version of this project on Ravelry – Blessed C2C Blanket. Check out the EyeLoveKnots Ravelry page to keep track of all your EyeLoveKnots favorites in your que, and share your WIPS and finished projects! Don’t Crochet but Interested in Purchasing a Blessed C2C Blanket? Visit the EyeLoveKnots Etsy Shop to see what I have available! Use the search box to type in what you have in mind, or feel free to send me a message with your custom request. I am happy to make in any custom size and/or color. View color options here: I Love This Yarn. This is so lovely though so totally and completely worth it. It was totally worth it, and my mom already claimed it before I had even finished. I will admit, I am one of those that does not enjoy sewing in the ends, but surprisingly, I have found quite a bit of makers that really do enjoy it. To each it’s own. wow, I love it! and maybe not too many ends to weave in that one will go crazy altogether! thanks so much for sharing on craft schooling Sunday, have yet to try a C2C, but your project is so inspiring I may just have to give it a try. I am not one to like all the ends – in fact, I have many projects in my WIPs bin because of the ends, but for this blanket, I weaved all of my ends in after I finished the last color change, and then continued working the blanket. It really wasn’t that bad. It’s a lovely blanket, thank you for sharing the pattern at The Really Crafty Link Party. I don’t see words on crocheted blankets very often and this is really neat. Thanks so much for sharing it on Merry Monday. Thanks so much, Erlene! It came from a vision I had of the word “Thankful” down the side of a scarf I was working up at the time. The word ended up being too big for the scarf, but then I saw this blanket. Came together perfectly. My mom thought so too! She claimed it before I was even really done with it. Hehe. What a lovely blanket. I have noticed Blessed on things, but I bet I will now. Thanks for sharing at my party. Thanks so much for hosting! I really enjoy the fiber party.